This is my mother’s recipe for a simple chili. Since our heritage is Norwegian, we call it “Norwegian style chili” in our family. 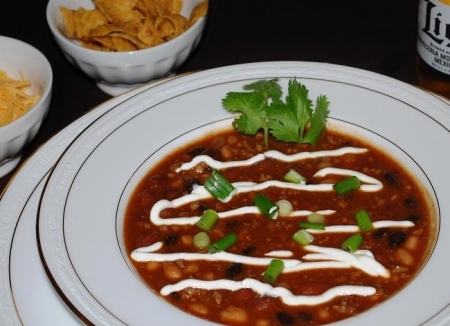 Basically, if you can open a can you can make this chili! I have added some fun garnishes that she normally would not have used, but I think they add a nice extra touch. In a large pot, heat oil over medium to high heat and sauté onion until tender. Add beef and brown, stirring often. Additional oil may need to be added. Add garlic when beef is almost browned and sauté for about 30 seconds. Add remaining ingredients and stir well. Bring to a boil, stirring often and then lower heat. Simmer over low for about 30 minutes, stirring occasionally, until flavors are blended. Ladle into bowls, garnish if desired and serve. Try a Corona with a wedge of lime, Modelo Especial (Mexico), Fireman’s #4 Blonde Ale by Real Ale Brewing Company (Blanco, TX), Saint Arnold Elissa IPA (Houston, TX) or try a margarita – Classic Margarita.